I went for a quick walk with the dog after work. I was planning to paint a portrait later on and had all the preparations made. But just after sunset the clouds parted and the half-moon reigned supreme in the southern sky. This scene, more or less, presented itself and the portrait was abandoned. I’m a landscape person at heart. Figure painting, for me, is only to add a little extra to my landscapes. This painting was slightly different in execution to previous work. The canvas was tinted with a dilute Cerulean Blue and allowed stand for an hour. Some parts of the canvas were not overpainted so the blue peeps through here and there. The idea was to paint a dark scene without the painting being dark or dull. In other words, the scene must immediately say ‘moon light’ and not daylight ‘gone wrong’. In northern latitudes, as in Ireland, the sky stays bright for a long time after sunset and if the moon is out the effect is magical. The colours: Burnt Sienna, Yellow Ochre and Cerulean Blue. Raw Umber and Cobalt Blue were also used as were Black and White. When the painting dries I will ‘shave’ off the thick impasto of white around the moon. This will brighten the area by removing the shadows the thick paint produces. Generally, thick impasto isn’t a problem if the entire surface has a consistent ‘roughness’. It can look a little odd if it is in a small area of an otherwise smooth surface. The process was videoed for a future post so you will see the painting method from start to finish. 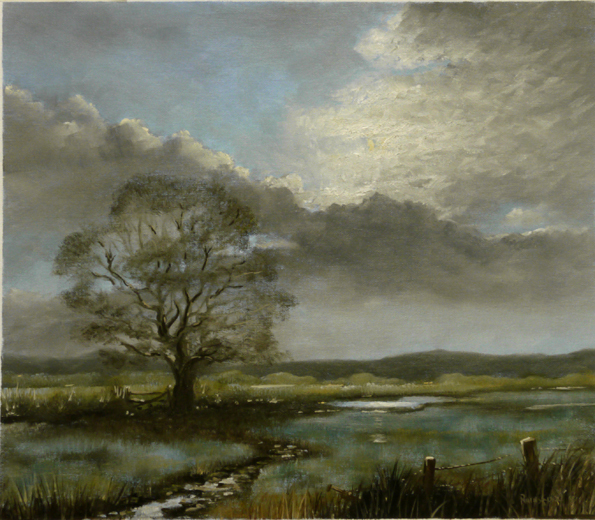 This entry was posted in Oil Painting and tagged Art, Culture, Education, Inspiration, Oil Painting, Oil Painting Instruction, Painting Moonlight. Bookmark the permalink. I believe Twilight was what you were meant to paint! It is moody, ethereal and beautiful. I am eager to see the video when you post it! Thank you. I’m uploading the said video as I write this. I hope you enjoy it. Wow, this is so lovely. I can feel the soft quiet of the night in it. Thank you. When I saw your flower photos in a recent post I was reminded of how different our climates are. We are well and truly into the season of year’s end. The trees are bare and beautiful flowers, like yours, are a fond memory. The flavour of landscape painting will change soon. I love the orange harmony of ‘Between Building’ – nice warm colours. Great that you liked my ‘Demolition of an Ice cream’. Nice to get responses. Your’e doing interesting things here. And I like your vibrant colours. Very different to what I’m encountering at the moment with the onset of our cold, damp winter. This scene made me sigh a relaxed ” aaaaah”. Beautiful & tranquil—& a time of day not often successfully painted. Kudos!